Getting the flu is no walk in the (dog) park, especially for pups who probably don't understand what's happening to them. Canine Influenza Virus (CIV) is a relatively new discovery in the disease world, but it's gaining momentum and hitching rides overseas as eagerly as college kids ready to study abroad. Here's everything you need to know about CIV to protect the dog in your life. 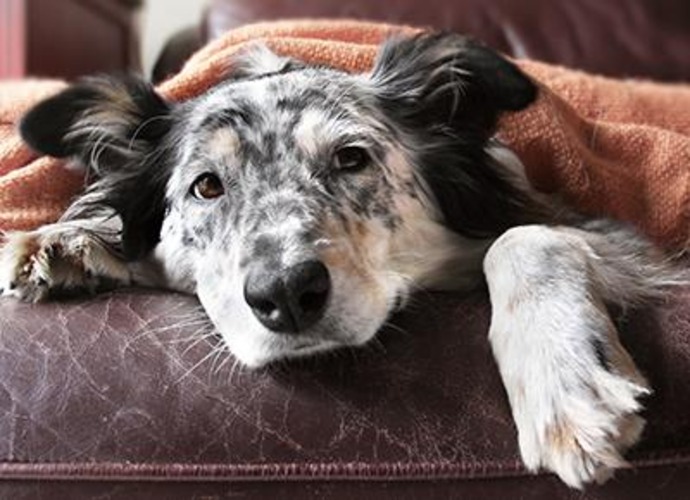 Dr. Karen Stasiak, a veterinarian at the animal health care company Zoetis, says appetite loss, cough, lethargy and a runny nose can all indicate a CIV infection. These symptoms can last for a few weeks and change depending on the strain. "As with flu in humans, symptoms and severity of infection may vary from dog to dog," she adds. It's also worth noting symptoms of CIV H3N8 are less intense than those of CIV H3N2. Keep an eye on your pup and visit the vet even if a cough seems mild or a runny nose isn't super detrimental to your dog's energy levels. While the Centers for Disease Control and Prevention reports there are no known cases of humans contracting either strain of CIV, Dr. Stasiak noted in 2016 a group of cats in an Indiana shelter contracted H3N2 after contact with infected dogs. This means dog flu can spread to other pets in the house, which could be a pretty miserable situation. Let's cut to the chase: Can CIV kill my dog? This is a tough question because it depends on the dog. After two to three weeks, most pups are back to their usual selves. Just like when you get the flu, your body fights it off as best it can and eventually you get better. Unfortunately, there is no medication that cures CIV H3N2 or CIV H3N8. Like something out of Outbreak, the virus is always adapting. Not to fear! There are other actions you can take to make your dog's life easier. Don't forget to be a responsible dog owner, too. If your dog is diagnosed with CIV, keep her away from other pets and animals. The AVMA recommends isolating dogs infected with H3N2 for at least 21 days​ and dogs infected with H3N8 for at least 7 days to avoid spreading the disease. The best treatment is steering clear of CIV in the first place. Since it's so easy to catch and tricky to treat, one of the best ways to do this is through vaccination (basically a flu shot for dogs). Zoetis offers the Vanguard CIV H3N2/H3N8 vaccine, which targets both strains-obviously, talk to your vet about your options. If there's a confirmed outbreak in your area (or honestly, even if there's not), washing toys, bowls, beds and leashes frequently is smart. Kill those germs ASAP! If you run into the neighbor's dog on your way inside, wash your hands before handling your own pup. Even if another dog doesn't display symptoms, he could be carrying the virus. If you are concerned at all that your pet may be showing signs of dog flu, contact your veterinarian and keep your dog at home. You don't want to be the source of an outbreak! And you certainly don't want your dog to feel ill.